A meaningful service can provide comfort when cremation is the choice. At Horan & McConaty, we help you arrange the gathering you desire at the appropriate time. Cremation, in fact, presents unique opportunities regarding the type of service and memorial. The degree to which we have loved is proportionate to the need to grieve. Routinely, I see co-workers and staff celebrants learning about the life of the person who died and creating healing moments to lift people up and lend meaning. Our facilities are modern and designed for hospitality, multi-media, and gatherings of almost any size. We publish an online obituary (at no charge), coordinate with the clergy/celebrant/officiant, organize seating and sometimes parking, set up memorabilia and flowers, greet people as they arrive and provide memorial folders and/or cards, usher as needed, manage the multi-media presentation of your photos/video vignettes (at no charge), and provide service direction to ensure your wishes are observed. Our presence makes things much easier, especially important on one of the most difficult days of your life. It will be necessary to select or provide a container for any viewing and/or the cremation process, as well as a container for the cremated remains. We offer a wide variety of rental and combustible containers for cremation. We also offer a wide variety of distinctive and value-priced urns. This package includes Basic Services of Funeral Director and Staff, Transfer to Mortuary from place of death, Embalming, Other Preparation, Dressing and Casketing, Viewing (one day), Funeral Ceremony, ceremonial casket and alternative cremation container, and Crematory Fee. Add urn and any use of coach if service is held at church or away from mortuary. When purchasing this package, you are entitled to a 10% savings in The Cremation Gardens. This package includes Basic Services of Funeral Director and Staff, Transfer to Mortuary, Memorial Ceremony, and Crematory Fee. Add a combustible container, and the urn selected. You may also add pre-cremation identification. When purchasing this package, you are entitled to a 10% savings in The Cremation Gardens. This package includes Basic Services of Funeral Director and Staff, Transfer to Mortuary from place of death, Crematory Fee, and use of our Reception Center for a Memorial Reception (see Reception Center and Catering Menu for complete options). Add a combustible container and the urn you select. This package enables you to receive and host your family and friends in one of our seven warm and welcoming reception centers, honoring the basic human need to express and receive support from others during some of life’s most difficult times. A podium with microphone is available, a memorial video from photos you supply, and any music you prefer. Your gathering may be as simple as a toast to a loved one or facilitated by a person to include sharing of memories. When purchasing this package, you are entitled to a 10% savings in The Cremation Gardens. This package includes Basic Services of Funeral Director and Staff, Transfer to Mortuary from place of death, Crematory Fee, Viewing in Stateroom, Cremation Container (Shaker Pine), Memory Folders, Enlarged Photo (18×24) of Loved One, Colorful Markers for personalized notes to be written directly on the casket. Add the urn you select. This package enables you to view or just be present with your loved-one for up to an hour to say final goodbyes. Many will write a personal note on the cremation casket with a colorful marker or leave a memento to be cremated with their loved one. We would be honored to create a special playlist of music to be played in the background. The Final Farewell takes place in one of our staterooms, between the hours of 10:00 AM and 3:00 PM. This package includes Basic Services of Funeral Director and Staff, Transfer to Mortuary, Crematory Fee, Professionally Produced DVD Memorial Tribute, Memorial Package (folders, book, and acknowledgments), In Loving Memory Box, and an Allotment for Floral Tributes. The purpose of this package is to provide memorialization products to families choosing to hold memorial services for their loved, on their own, without the use of our chapel or the assistance of funeral directors. When purchasing this package, you are entitled to a 10% savings in The Cremation Gardens. This package includes Basic Services of Funeral Director and Staff, Transfer to Mortuary, and Crematory Fee. If you want to arrange a direct cremation, you can use an alternative container. Alternative containers encase the body and can be made from materials like fiberboard or composition materials (with or without an outside covering). The basic containers we provide are unlined, leak resistant and made of heavy cardboard. When purchasing this package, you are entitled to a 10% savings in The Cremation Gardens. This package includes Basic Services of Funeral Director and Staff, Transfer to Mortuary, Crematory Fee, Use of Professional Vehicle to cemetery for urn, and Funeral Director and Staff for Graveside Service. Add a combustible container and the urn, Memorial Products, and Catered Reception as selected. Safe and secure for your peace of mind – Most are unaware no standards and no inspections exist for crematories in Colorado. Consequently, other cremation companies outsource the transfer of the deceased and the cremation to low-priced bidders who operate in industrial areas. 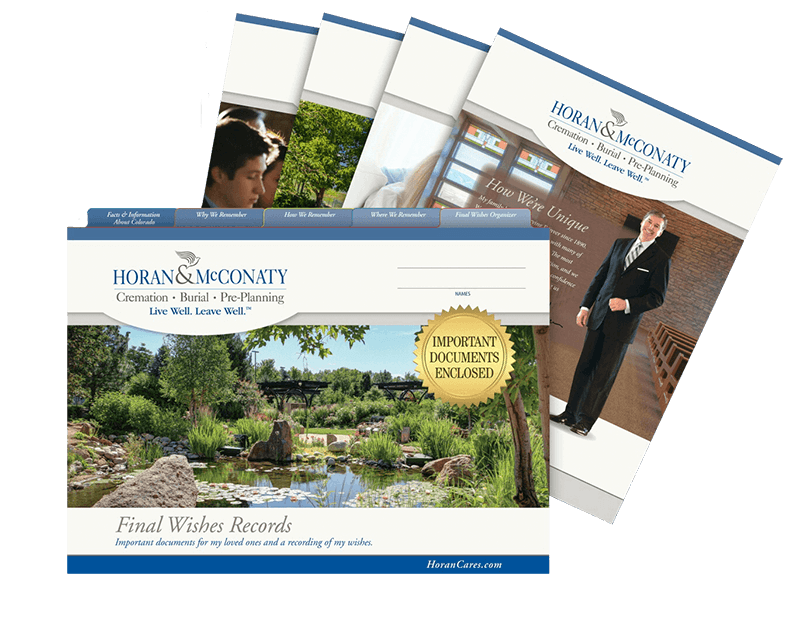 By choosing Horan & McConaty, you gain peace of mind with our superior cremation services and the comfort of knowing that your loved one will always be in the compassionate, capable hands of our staff. We offer cremations at our private crematory so your loved one never leaves the shelter of our expert care. Most importantly, our certified, trained professionals handle every step of the cremation process with dignity and respect. Clean, secure crematory – We are among the few mortuaries to operate our own crematory inside our clean and secure facility. Individual cremations – Adhering to the highest standards, our experienced professionals follow a rigid 23-Point Pre-Cremation Checklist. Additionally, two staff members participate in every step of the process, assuring that your loved-one is cared for appropriately. You can rest assured that we cremate one individual at a time and diligently remove and track all cremated remains. Identity Assurance – Your peace of mind in knowing your loved one is being properly cared for is important, especially in Colorado, the only state without inspections, licensing, or meaningful oversight. That’s why we invested in a digital tracking process that begins the moment your loved one is in the care of our staff. This uniquely designed process not only tracks your loved one, but all personal effects as well, until the final disposition of the cremated remains. Horan & McConaty is the only firm in our state to offer this unique safety feature. Personal inspections – We are the region’s first crematory to encourage each family’s personal inspection of our facilities. We also offer a special viewing room located next to our crematory for those who wish to be present for the start of the cremation. Cremation is an irreversible process. Where there is human involvement, there will always be the potential for human error. This can apply to hospital, coroner and mortuary staffs. To be safe and sure, for your peace of mind and ours, we highly recommend a positive identification of the deceased before cremation. In our memorial service and direct cremation option, there is no Embalming and only a limited time that the deceased may be transferred out of refrigeration and identified (refrigeration or Embalming are required by state law 24 hours after death – CRS 12-54-111). We provide two different cremation viewing options. The cremated remains of your loved ones may be safely held in one of our many above-ground columbarium niches. Your loved one's cremated remains may be scattered freely into our ossuary located within a dedicated, natural environment. You invite you to take tour of Cremation Gardens®. You may choose in-ground placement on a family plot. Urns may be placed at the head or foot of a gravesite, with the exception of our Cremation Gardens®. Inscribe your family member's name and a special saying on a tree plaque, park bench or other special memorial. We also offer custom, unique urns and keepsakes to bring comfort, connection and meaning inside your home. You may learn more about our Keepsakes by clicking the link below. please contact us at Horan & McConaty.